Energizer and Nuffnang power my life through redefining Balance. In this fast-paced world, where everyone works hard to get to the top of the corporate ladder, I often ask myself if I am leaning against the right wall. I frequently suffer from burnouts so I sought to redefine success and rethink my priorities. I can't help asking myself about the last time I achieved and enjoyed something my family and friends. I had a hard time recalling an instant wherein I even achieved AND really enjoyed something just for myself. It was then that I realized that I need to energize my inner life as I cultivate my spirit! The task to realign my life religiously becomes a pressing concern. Like most working mothers out there, I am torn between seeking ways to augment family income and focusing on my child on a full time basis. I do believe that the parenting choices we make creates major impact on how our children would become productive citizens of the society we belong to. And ultimately, every mother's goal is to enforce that loving bond between mother and child. Before being a community member of Nuffnang, I try to focus what I'd like to enjoy with my family at home night when I walk in the door. And I'd often think about doing a movie marathon over bowls of popcorn with my spouse and daughter especially on Friday nights. I am glad that my remote device has a long-lasting pair of batteries courtesy of Energizer to make our bonding moments hassle-free. I know that my child's battery-operated toys will keep her occupied and entertained while she waits for me to come home from work. 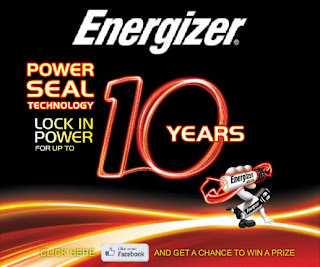 I rely on Energizer batteries for a reliable source of power for my home appliances and gadgets as well. Energizer powers my lifestyle by increasing my productivity, allowing me to do multi-tasking acitivities whether at home or at the office. And definitely, worries on draining batteries becomes a thing of the past. I love that fact the Nuffnang provides a community for bloggers and organizes events d movie screenings, press releases and others to strike a balance between my work and family life. Nuffnang allows me to lead a balanced and fulfilled life rooted in real values. Finding quality bonding time with my family is now made easy by joining in Nuffnang-sponsored activities. And Energizer ensures life moments with my family and my blogging community circles are captured each time! Thank you, Nuffnang and Energizer! I'm looking forward to our lasting relationship! Share a blogpost on “How do Energizer and Nuffnang power your lifestyle?” and to do to win two (2) tickets to our movie screening: Write a blog post answering the question “How do Energizer and Nuffnang power your lifestyle?” and get a chance to win two (2) movie tickets to a special screening of The Amazing Spider-Man on June 29th. This event is made possible by Nuffnang and Energizer.